Have I mentioned before that cherries are one of my all-time favorite fruits? Perhaps I might have. I so look forward to cherry season each year. 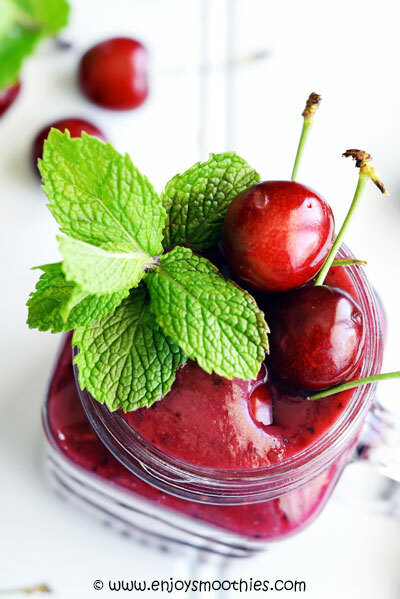 While frozen cherries make great smoothies, there is nothing quite like the fresh variety, although I have to admit that pitting them can be a pain and I usually end up eating most of them before they ever reach the blender. Although cherries belong to the stone fruit family (the same as peaches, plums and apricots) they go perfectly with berries. Perhaps it has something to do with their plump, dark red skins and their sweet taste. Cherries come in two main varieties: sweet and tart. 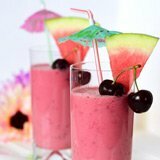 I use the sweet varieties for my cherry berry smoothie recipes. The tart varieties are more usually reserved for baking. 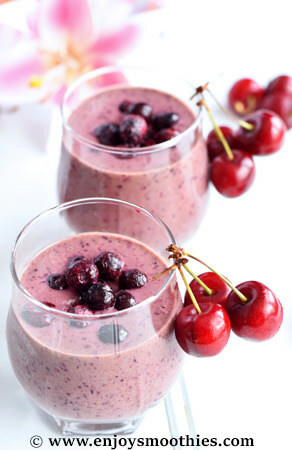 Cherries make such a wonderful addition to any smoothie. 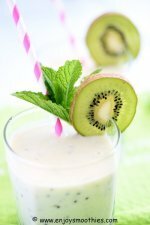 They are low in calories and a rich source of phytonutrients, vitamins and minerals. 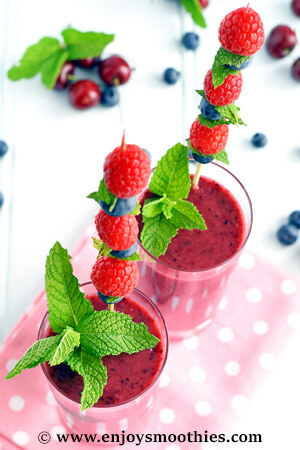 As with all berries, cherries also contain powerful antioxidants. 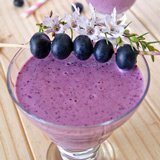 Two such compounds, anthocyanins and bioflavonoids, act as an anti-inflammatory. This is why they are recommended if you suffer from gout, arthritis or fibromyalgia. So any cherry berry smoothie is going to be a super delicious medicinal drink. Beetroot is also full of antioxidants and has also been found to lower blood pressure. 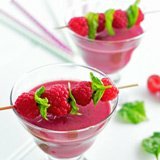 Blend together the banana, beet, cherries, blueberries, raspberries, almond milk, pomegranate juice and ground cinnamon until smooth and creamy. Pour into your favorite tall glasses and enjoy. 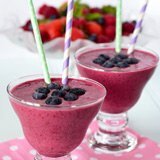 Add the banana, cherries, mixed berries, almond milk, orange juice and grated ginger to your blender. Whizz together until all ingredients are well blended and smooth. This makes two generous glasses. 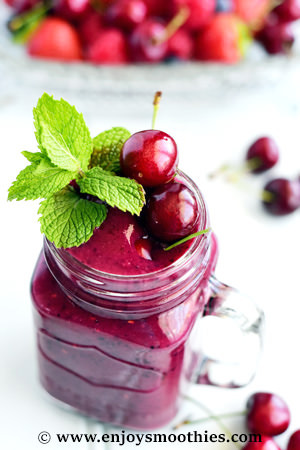 Add the banana, cherries, blueberries, almond milk, almond butter and ground cinnamon to your blender. 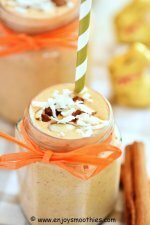 Blend on high until all the ingredients are smooth. 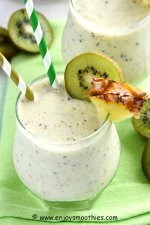 It is recommended that you don’t use all frozen fruit, otherwise your smoothie will be far too thick and gluggy and won’t blend properly.